PCS and its members produce different newsletters to keep our members informed about activities and developments regarding their computers as well as club activities. The "Messenger" is the PCS monthly newsletter and is distributed in hard copy form at our General meetings. It is edited and produced by Ken Johnson. For previous editions, visit the "Messenger" page. 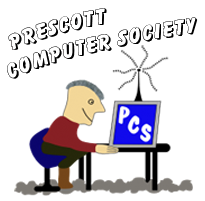 PCS is a member of APCUG (Association of Personal Computer User Groups). To the extent that any of the articles included in the "Messenger" have been written by APCUG members or contributors, that article has been provided to APCUG by the author solely for publication by APCUG member groups. All other uses require the permission of the author. Please contact APCUG about requesting permission to publish such articles or for additional copyright information. Another newsletter is sent out in email form each Monday morning. This publication provides up-to-date information regarding PCS activities, a "Tips & Tricks" section and links to other relevant information. Distribution of this useful and informative newsletter has been restricted to current members and is only one of the many benefits of joining our organization. If you are having trouble receiving your weekly email newsletter, please refer to this question as listed on our FAQ page. In the extremely unfortunate event that you wish to unsubscribe from the weekly email newsletter for any reason, please let us know. PCS is a member of APCUG (Association of Personal Computer User Groups). Their stated mission is "to facilitate communication among computer user groups, the community, and the technology industry." We have posted their recent newsletters on our APCUG page.